Essential in commercial buildings like offices, residential properties like flats and in everyday homes; door entry systems are the ultimate way to know who you’re opening the door to. Open gate systems, security chains and toes against the door just aren’t adequate security at home or at work, and door entry systems are a simple and highly effective way to improve security and keep it practical. Entry systems can vary from basic “buzz in” intercom panels to the latest in videophone technology placed on your door, gate or any entranceway. Tied in with access control and staff entry systems such as keypads, swipes or proximity sensors and it’s like having the very best in door security 24/7. 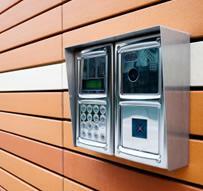 Our installations team combine decades of experience throughout the domestic and commercial security sectors. From locksmiths to electricians and carpenters Security Masters have the expertise to manage all your physical and electronic security needs, and are recognised by the Master Locksmiths Association. We take pride in quality security installations, fully tested for absolute customer satisfaction. We work with commercial, retail and industrial clients across the UK providing emergency locksmith call outs as well as our range of security installations. Private homes are also one of our specialities and we focus our services throughout London, Kent, Essex and the Home Counties. With a full advisory service on all aspects of your security and fast turnaround times on all our work we can help keep your property absolutely secure.